If you are searching for good looking and safe nerf bars, you don't need to look any further than the Westin stainless Pro Traxx 4" oval nerf bars! These not only will make your truck look great, you'll be safer stepping out or into your truck. These oval tube steps are made from quality T-304 stainless steel four inch tubing. Westin uses a wide, saddle style step pad on these step bars to ensure sturdy footing. Deep, aggressive treads cut into each step pad help channel water and mud away from your feet, further improving the safety of these nerf bars. Mounting your stainless Pro Traxx oval nerf bars is simple and easy. Each set of nerf bars comes with custom fit mounting brackets and zinc plated stainless steel hardware that requires no drilling into your truck. Did we mention the head turning good looks? Stainless Pro Traxx oval nerf bars have 30 degree bends at each end with fully welded and domed end caps for a uniquely smooth and stylish appearance. 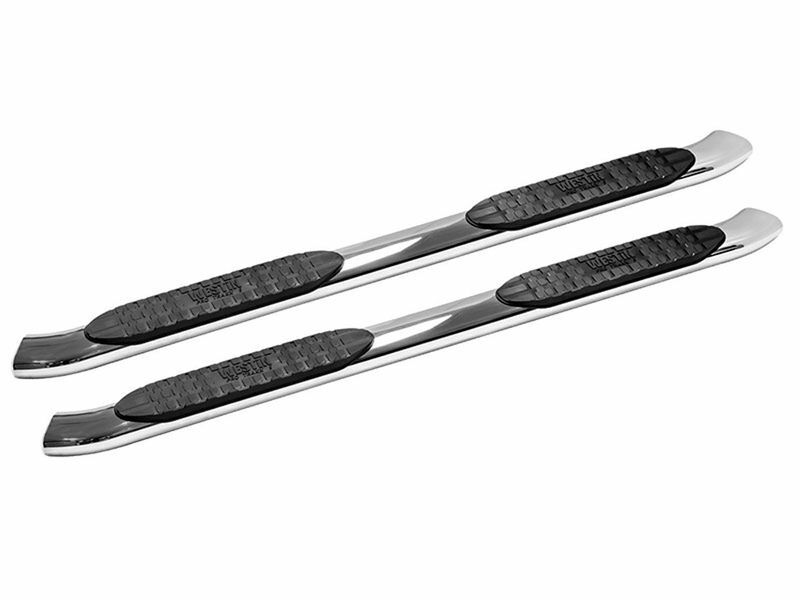 Westin stainless Pro Traxx nerf bars are sold as a pair. You're going to be turning heads when you go out cruisin'! Installing a set of Westin stainless Pro Traxx nerf bars is simple and easy enough to do at home without any drilling or cutting. Easy to follow, visual instructions come included along with all the necessary hardware. For additional information or if you have any questions, please call us at 1-877-216-5446 or 701-253-5906.